This year, articles abound in coverage of police brutality, racism, and discrimination. Social media pages are inundated with shared commentary, videos, and op-eds related to these cases. People across the nation scream for justice in the streets, on the sidewalks, and even on interstate highways, while college students and commuters stage die-ins at libraries and substations. Friends, colleagues, and family members clamor in debate, as the topic was nearly guaranteed to appear on every menu at Thanksgiving dinner. The conversation proceeded as it began, and it ended likewise, with discrimination. What is this word, discrimination? Dictionary.com defines "discrimination" as the "power of making fine distinctions." The website also includes an alternative definition, which describes the word as embodying "treatment or consideration of, or making a distinction in favor or against, a person or thing based on the group, class, or category to which that person or thing belongs rather than on individual merit." The same website defines "merit" as "something that deserves or justifies a reward or commendation." These definitions contain great abstract notions in addition to striking truth. Yet, allowing for a more critical analysis of these words, one might easily discover that these definitions are equally hinged upon arbitrariness and incompleteness. For example, the power of making fine distinctions is a competency relevant only to the respective capacities, experiences, and knowledge of the individual. Furthermore, there exists surely no omniscient person of this land who can determine where someone or something belongs, while individual merit is entirely dependent upon the perception of another and the extent to which he or she is able to seemingly justify another's commendation. The alternative definition of discrimination even employed its synonym in its definition, metaphorically showing its hand in a display of ambiguity. In the end, these terms suffice to capture an idea, but they fail to communicate a precise universal application. They rather suggest a framework through which people may satisfy these broad terms. Ultimately, every animate being is the victim of the reinforced survivalist instinct, through which he or she has developed expedient concepts and binary extrapolations of the world, through which assumptions of good and bad manifest themselves in this word discrimination. Amidst the protests paying homage to the likes of Eric Garner and Michael Brown, the Michigan House of Representatives passed a bill which would allow anyone to refuse service to any other on the basis of "deeply-held religious beliefs." This press release has aroused great public fervor, especially within the LGBT community. A deluge of protests, such as this one, have flooded Facebook news feeds: "Does anybody actually CARE about gay people, or am I just a second class citizen? For real. Religious freedom does NOT mean you can be a jerk." This protester continues, "I'm pretty sure everyone here is aware that discrimination is never justified in any instance or condition. Saying that it would be screams of Any Rand....[sic]." This person's comments are certainly well-intentioned, and this author cannot doubt her sincerity. However, sincerity is a highly overvalued virtue in this world. The matter here is one of great nuance, distraction, and self-interest. With respect to these popular notions against discrimination, there is potentially no person who would suggest that individuals must relinquish their discretionary freedoms as soon as they execute a voluntary trade. The challenge in supporting this claim would be in determining which parameters constitute an official business. When does the voluntary collaboration of individuals become an enterprise? Moreover, why must these persons be responsible for anything? At what point do they indeed become responsible? Is everyone then somehow obligated to offer me every service which he or she has offered before? Despite the religious basis of the bill here discussed, the idea is completely irrelevant in this conversation. This is solely a matter of natural responsibility. Based on these popular protests, if the readers of this article were to, at this very moment, appear at these protesters' front doors, they might reasonably expect to be served in the way that they demand. Is this not the nature of business when it is crossed with reinforced entitlement? Another challenge for this faction is that of overcoming their inconsistency in defining those conditions under which discrimination is justified. Of course none of the participants in this protest are discriminatory. 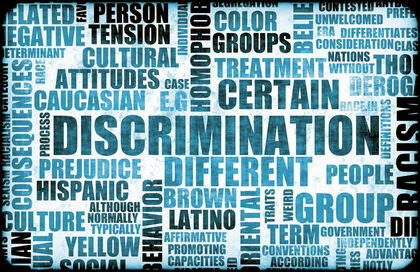 It is only the other who is discriminatory. And surely none of the protesters have discriminated in where they've decided to live or travel, or in how they've dated, whom they've married, what they've bought, when they've bought, how much they've bought, and what, when, and how much they've sold. Of course they've also never selected their own friends, schools, classes, employers, vendors, investments, or modes of entertainment. In fact, discrimination in no way resulted in how this message has appeared before you in this very instance. The sum of individual rational self-interests, the atomic assignment and comparison of values and preferences, are aggregately and manifestly synonymous with discrimination, yet, per the claims of these protesters, no one would ever be justified in these evil behaviors. The reality is this: from scarcity comes discrimination. The latter is merely the appearance of choice in a sea of potential alternatives, while some people are included and others are excluded. In the same way that the reader of this article approaches his or her dating life, or in the way he or she has decided whom to marry, billions of people have been excluded by his or her ultimate selection, and a certain sum of individuals will always be excluded by dozens of personal decisions at any given moment. In the scenario of dating, billions of opportunities were never granted, yet one person has been included and each partner benefits on a relative scale while the absolute opportunity cost is left largely unknown. However, I doubt that there was a single protester at the reader's wedding or, for the unmarried reader, in attendance during his or her dates. Selections are seldom, if ever, based upon comprehensive information. There is always the limit of time which hastens the process, which may enable some choices to seem less complex than others. In this way, overt discrimination is perceived, and this type of discrimination is far less palatable than its more complex counterparts. Neither form is more justified than the other. Some are simply less recognizable, thus requiring a more sophisticated education and greater attention span to notice the distinctions. Being that physical appearances are far more noticeable than any other characteristic, the general population will naturally become far more readily aware of trends related to them. Whether their correlation equates to causation, however, is another matter altogether. In addition to the previous fallacy, straw men and platitudes tend to resonate amongst these protests. They consistently berate businesses and corporations while forgetting that these entities are managed by people. They are nothing more. In fact, businesses don't live, breathe, or discriminate, in the same way that businesses don't pay taxes. Only people can perform these functions. These entrepreneurs have indeed employed discrimination in their business models, by determining what and where to produce, and on what scale. This will somehow be defined as something other than discrimination, yet that is precisely what embodies the spirit of business, for no indiscriminate business can succeed, as it will invariably yield useless quantities of equally undesirable qualities which the market will discriminatingly elect not to sustain. In the same way, very few entrepreneurs will elect to employ discrimination beyond financial considerations, which are the most ubiquitous and conspicuous forms of market discrimination. However, if such a vendor decides to discriminate on the basis of some personal characteristic beyond financial consideration, that producer may injure the reputation of the business, and that externality is delivered at a cost to the business owner. Therefore, the business owner will ultimately pay the cost for unreasonable discrimination. However, most business owners are sufficiently encouraged by competitive markets to sacrifice those personal values to maximize market value, which will in turn optimize market opportunity for everyone. In the end, discrimination, prejudice, and racism are of the same ilk: they are the very human response to forces which compel them to operate upon the basis of incomplete information. To claim that one's discrimination should be illegal is to reason that all activity which you, or some arbitrary set of followers, detest must be punishable by the initiation of force against the discriminator. Again, this is to ignore that all persons discriminate and to condemn them to the shackles of arbitrary opinion. Yet, in the case of the protesters, their intolerance for fellow intolerance is somehow, inexplicably, far more justified. Ultimately, the bill's absurdity is surpassed only by the circumstances which rendered it necessary. These circumstances are those in which proprietors have been punished by law for retaining their private property and refusing to give it to people whom they dislike or with whom, for any number of reasons, they refuse to work. Remember, your sense of entitlement fails to justify another's responsibility. We are either free to choose, and equally free to discriminate, or we are victims of those whom we've allowed to discriminate on our behalf.